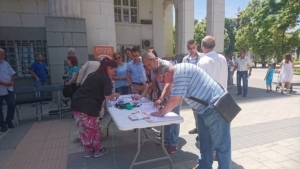 May 31st proved to be a busy day as the EMIN bus tour rolled out from Bulgaria and crossed the Danube into the beautiful country of Romania. However, prior to leaving we had one last programme in Pleven. As with all previous events in Bulgaria this one proved to be just as exquisitely organized, our hosts In EAPN Bulgaria can only be praised for a fruitful and brilliantly organized programme. Pleven is a small city in norther Bulgaria and it was the host to our final stop for a brief happening with the bus in Vazrazhdane Square in the centre of the city. 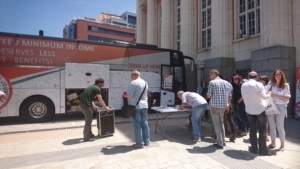 Despite the rather short length of the happening, we received a very encouraging response from the locals, with many young people signing both the petition to secure a reasonable and dignified Minimum Income across Europe and of course writing messages of hope onto the EMIN bus. Following the happening we had our last meal in Bulgaria after which we were once more moving this time onwards to the border with Romania accompanied by some of the members of EAPN Bulgaria. We crossed the boarder in the early evening to enter the city of Giurgiu where we were met by our hosts from the Romanian network of the EAPN, RENASIS.